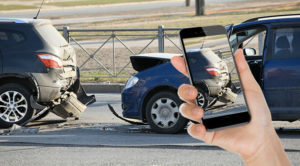 If you have been involved in a car wreck, put those smartphones to good use: Take as many photographs and videos as you can. example, photographs of skid marks can establish how fast a vehicle was going and when the driver began braking. If there could be a dispute as to who had the green light in an intersection collision, video of other cars going through the intersection can establish the traffic signal patterns at that time of day. Video can show that an impaired driver is stumbling and slurring, or photographs can show a beer can in the drink holder. Photographs of bruising across someone’s shoulder, chest, and hips can prove the person was wearing her seatbelt at the time of the collision. You may be unable to take photos and video of the scene if you are injured, or you may be afraid that this could lead to a confrontation with the other driver. Once a police officer arrives at the scene, ask the officer to take photographs and video to preserve evidence. Be sure that photographs of all vehicles involved in the collision are taken. Photographs are also very important in documenting injuries. It is one thing to read in the medical records that someone suffered a cut to his face requiring 20 sutures. It is quite another to see a photograph of the wound before it was stitched up by the doctors. Photographs can also help show how long it took for an injury to heal. Do you still have bruising 2 weeks after a collision? Take pictures. Do you still have a permanent scar 6 months later? Take pictures. years, my clients have lost important evidence because their phones got wet or went on the fritz, or they bought a new phone and forgot to transfer pictures to the new one. If you hire an attorney, get those photos and videos to your attorney as soon as possible. If you have been involved in a car wreck and have questions, please give me a call at 859-559- 9947 or send me an email at stacy@stacyivey.com. The initial consultation is free.